IDA = Iron deficiency anemia; MDS = myelodysplastic syndrome. *This page is intended as educational information for healthcare providers. It does not replace a healthcare provider’s professional judgment or clinical diagnosis. †Anemia, neutropenia, thrombocytopenia, or pancytopenia. ‡Unusual sites include hepatic veins (Budd-Chiari syndrome), other intra-abdominal veins (portal, splenic, splanchnic), cerebral sinuses, and dermal veins. §Detects PNH cells down to a 0.01% clone size. The diverse and common symptomatology of PNH can delay diagnosis. 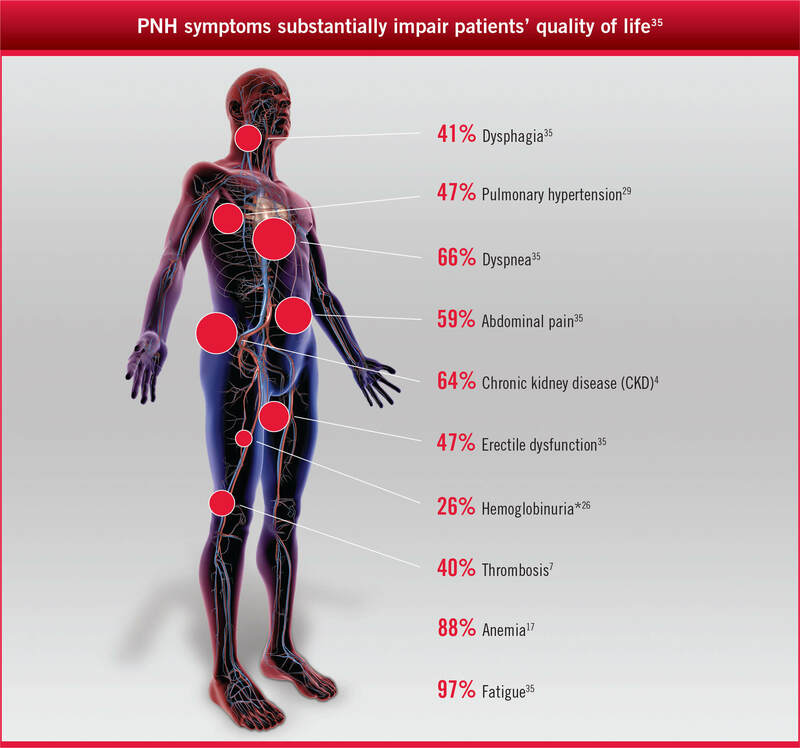 Find out about the variety of symptoms that can occur in a patient with PNH. References: 1. Iwanaga M, Furukawa K, Amenomori T, et al. Paroxysmal nocturnal haemoglobinuria clones in patients with myelodysplastic syndromes. Br J Haematol. 1998;102:465-474. 2. Rachidi S, Musallam KM, Taher AT. A closer look at paroxysmal nocturnal hemoglobinuria. Eur J Intern Med. 2010;21:260-267. 3. Borowitz MJ, Craig FE, DiGiuseppe JA, et al; for Clinical Cytometry Society. Guidelines for the diagnosis and monitoring of paroxysmal nocturnal hemoglobinuria and related disorders by flow cytometry. Cytometry Part B. 2010;78B:211-230. 4. Hillmen P, Elebute M, Kelly R, et al. Am J Hematol. 2010;85:553-559. 5. Socié G, Muus P, Schrezenmeier H, et al. Blood. 2009;114: Abstract 4030. 6. Kasahara S, Hara T, Itoh H, et al. Hypoplastic myelodysplastic syndromes can be distinguished from acquired aplastic anaemia by bone marrow stem cell expression of the tumour necrosis factor receptor. Br J Haematol. 2002;118:181-188. 7. Galili N, Ravandi F, Palermo G, et al. Prevalence of paroxysmal nocturnal hemoglobinuria (PNH) cells in patients with myelodysplastic syndromes (MDS), aplastic anemia (AA), or other bone marrow failure (BMF) syndromes: Interim results from the EXPLORE trial. J Clin Oncol. 2009;27: Abstract 7082. 8. Wang SA, Pozdnyakova O, Jorgensen JL, et al. Detection of paroxysmal nocturnal hemoglobinuria clones in patients with myelodysplastic syndromes and related bone marrow diseases, with emphasis on diagnostic pitfalls and caveats. Haematologica. 2009;94:29-37. 9. Brodsky RA. Paroxysmal nocturnal hemoglobinuria. In: Hoffman R, Benz EJ Jr, Shattil SJ, et al, eds. Hematology: Basic Principles and Practice. 4th ed. Philadelphia, PA: Elsevier Churchill Livingstone; 2005:419-427. 10. Wang H, Chuhjo T, Yasue S, et al. Clinical significance of a minor population of paroxysmal nocturnal hemoglobinuria–type cells in bone marrow failure syndrome. Blood. 2002;100:3897-3902. 11. Richards SJ, Barnett D. The role of flow cytometry in the diagnosis of paroxysmal nocturnal hemoglobinuria in the clinical laboratory. Clin Lab Med. 2007;27:577-590. 12. Rother RP, Bell L, Hillmen P, et al. The clinical sequelae of intravascular hemolysis and extracellular plasma hemoglobin: a novel mechanism of human disease. JAMA. 2005;293:1653-1662. 13. Hill A, Richards SJ, Hillmen P. Recent developments in the understanding and management of paroxysmal nocturnal haemoglobinuria. Br J Haematol. 2007;137:181-192. 14. Raghupathy R, Derman O. Response of paroxysmal nocturnal hemoglobinuria clone with aplastic anemia to rituximab. Case Rep Hematol. 2012;2012:106182. 15. Pu JJ, Mukhina G, Wang H, et al. Natural history of paroxysmal nocturnal hemoglobinuria clones in patients presenting as aplastic anemia. Eur J Haematol. 2011 ;87:37-45. 16. Hill A, Kelly R, Hillmen P. Thrombosis in paroxysmal nocturnal hemoglobinuria. Blood. 2013; 121:4985-4996. 17. Kinoshita T, Inoue N. Relationship between aplastic anemia and paroxysmal nocturnal hemoglobinuria. Int J Hematol. 2002; 75:117-122. 18. Tiu R, Gondek L, O’Keefe C, et al. Clonality of the stem cell compartment during evolution of myelodysplastic syndromes and other bone marrow failure syndromes. Leukemia. 2007; 21:1648-1657. 19. Baumgarten M, Gehr T. Chronic kidney disease: detection and evaluation. Am Fam Physician. 2011; 84:1138-1148. 20. Lee JW, Jang JH, Kim JS, et al. Clinical signs and symptoms associated with increased risk for thrombosis in patients with paroxysmal nocturnal hemoglobinuria from a Korean Registry. Int J Hematol. 2013; 97:749-757. 21. Kato GJ, McGowan V, Machado RF, et al. Lactate dehydrogenase as a biomarker of hemolysis- associated nitric oxide resistance, priapism, leg ulceration, pulmonary hypertension, and death in patients with sickle cell disease. Blood. 2006; 107: 2279-2285. 22. Lee JW, Jang JH, Kim JS, et al. Uncontrolled complement activation and the resulting chronic hemolysis as measured by LDH serum level at diagnosis as predictor of thrombotic complications and mortality in a large cohort of patients with paroxysmal nocturnal hemoglobinuria (PNH). Blood. 2011;118: Abstract 3166. 23. Weitz IC. Thrombosis in paroxysmal nocturnal hemoglobinuria—insights into the role of complement in thrombosis. Thromb Res. 2010;125: S106-S107. 24. Helley D, Peffault de Latour R, Porcher R, et al; on behalf of the French Society of Hematology. Haematologica. 2010; 95:574-581. 25. Stevens LA, Coresh J, Greene T, et al. Assessing kidney function—measured and estimated glomerular filtration rate. N Engl J Med. 2006; 354: 2473-2483. 26. Parker C, Omine M, Richards S, et al; for International PNH Interest Group. Diagnosis and management of paroxysmal nocturnal hemoglobinuria. Blood. 2005; 106:3699-3709. 27. Movalia M, lllingworth A, Weitz I, et al. Poster presented at the 53rd Annual Meeting of the American Society of Hematology; December 10-13, 2011; San Diego, CA. Abstract 1033. 28. Raza A, Ravandi F, Rastogi A, et al. A prospective multicenter study of paroxysmal nocturnal hemoglobinuria cells in patients with bone marrow failure. Cytometry Part B. 2014;86B:175-182. 29. Meyers G, Parker CJ. Management issues in paroxysmal nocturnal hemoglobinuria. Int J Hematol. 2003;77:125-132. 30. Mohanty BD, De Castro CM. Too many clots for comfort. Am J Med. 2012;125:243-245. 31. Sharma VR. Paroxysmal nocturnal hemoglobinuria: pathogenesis, testing, and diagnosis. Clin Adv Hematol Oncol. 2013;11:1-11. 32. Peffault de Latour R, Mary J-Y, Salanoubat C, et al; on behalf of the French Society of Hematology and the French Association of Young Hematologists. Paroxysmal nocturnal hemoglobinuria: natural history of disease subcategories. Blood. 2008;112:3099-3106. 33. Brodsky RA. How I treat paroxysmal nocturnal hemoglobinuria. Blood. 2009;113:6522-6527. 34. Tsai C-W, Wu V-C, Lin W-C, et al. Acute renal failure in a patient with paroxysmal nocturnal hemoglobinuria. Kidney Int. 2007;71:1187. 35. National Comprehensive Cancer Network. NCCN Clinical Practice Guidelines in Oncology: Myelodysplastic syndromes. Version 2.2015. http://www.nccn.org/professionals/physician_gls/pdf/mds.pdf. Accessed April 8, 2015. 36. Ballarín J, Arce Y, Torra Balcells R, et al. Nephrol Dial Transplant. 2011;26:3408-3411. 37. Dolezel Z, Dostalkova D, Blatny J, et al. Paroxysmal nocturnal hemoglobinuria in a girl with hemolysis and “hematuria.” Pediatr Nephrol. 2004;19:1177-1179. 38. Parker CJ. Paroxysmal nocturnal hemoglobinuria: an historical view. Hematology Am Soc Hematol Educ Program. 2008:93-103. 39. Clark DA, Butler SA, Braren V, et al. The kidneys in paroxysmal nocturnal hemoglobinuria. Blood. 1981;57:83-89. 40. Brodsky A, Mazzocchi O, Sanchez F, et al. Exp Hematol Oncol. 2012;1:26.